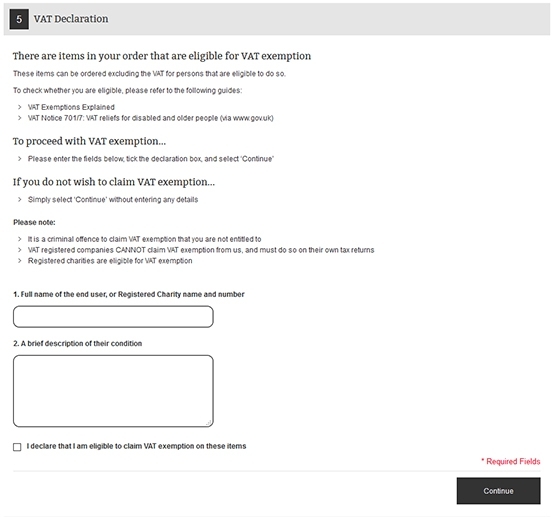 Selected products on our site are eligible for VAT exemption. For more information on eligibility, please view VAT Exemptions Explained. Step 1: How do I know if the product can be ordered without the VAT? In the product page there are two methods by which we display the product's eligibility. You will now be directed to checkout which will guide you step-by-step through the information and payment details we require. You must complete each step of the checkout, and cannot skip forward to a later step without completing the necessary information. Once you have ticked the box, press 'Continue' to proceed to the payment details step, before continuing again to the final Order Review page. Your order with VAT exemption is now complete.